Just out for a "scroll"? Check out each of Nick's Picks. There are new ones added all the time! Nick Vedros is all about creativity. If I've learned nothing else about my good buddy, it's simply that you never know what he's going to find on the Internet that will just get your wheels of creativity turning. At least once a week I'm adding a new Nick's Pick and hoping you enjoy them as much as I do. The newest pick will always be the first one up under "Today's Pick". What I love most about these is, they're constant reminders of the world outside our door. It's so easy to get sucked in and have a day go completely by where the only thing you thought about was the business. Just trust me on this and take the time to watch it. As imaging artists, you're all trained to capture emotion in your images. You turn intangible memories into tangible printed moments every day. But, what about the world we can't see? What about images being created all around us that are only visible thanks to technology? 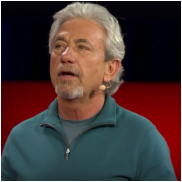 I love this TEDTalk because it took me to so many places I wouldn't have gone without Louie Schwartzberg's amazing skills. TED needs to be on your radar. I can promise you non-stop inspiration on so many different levels and topics. Just click the tab below to be introduced to the world of TED! If you know Nick Vedros then you already understand he's a perpetual student of advertising. He's on a never-ending search for the way manufacturers position and then present their products. He sent me the link to this new piece from BMW and the way it's been produced is stunning, along with the message tied to the future. I love the line from the narrator, "If what I say now seems very reasonable, then I have failed completely!" I just got an email from Nick Vedros with the following and a link to this video. While I know twenty seven million people have already watched it, I'm betting we can add to that number. Make sure your teenagers watch it too. "A Hong Kong cinema asked its patrons to leave their mobile phones ON when they entered.Using that situation, Volkswagen made an eye opening ad..."
It's a new Nick's Picks and this one has so much good information. First, I love the fact that the inspiration comes from an image Joe McNally originally did. You'll recognize it the minute it comes up in the video. Second, I love the planning process that started on a cocktail napkins. I've actually saved a few of those over the years. One of the cocktail napkin projects was RIT's Big Shot, the year they photographed the Intrepid with hand held flashes. It all started with a conversation Bill Dubois, then at RIT, and I had over dinner. This is one of those videos perfect to enjoy with your morning coffee. Great projects like this don't happen by accident and as you'll see, take creativity, talent, patience and some amazing planning! Nick's at it again and found this one that truly demonstrates just how real high-definition has become! It's only a two minute video, so just trust me and watch it. LG has started marketing it's new ULTRA HD TV. To demonstrate the realism ULTRA HD they conducted phony job interviews in Chile with an ULTRA TV replacing an office window. Too real. It's a new Nick's Picks and it's a classic, but don't just enjoy the talent of the musicians - catch the camera work and in turn the editing. This is great stuff bringing together the best in musical talent with great imaging and storytelling that doesn't get much better. And, at the end, there's a link to order the CD. If every infomercial we were forced to watch was this great, there would be no need to ever fast forward. It's another one of those videos found by Nick and a perfect addition to the collection here at SCU. Just watch it and trust me and then think about what it took to think this stunt up and then to perfect it...ouch! For me though, it's the way Volvo has delivered the message. This is about impact and it's the same way you have to address each message you put out to your target audience! A million people might have watched this already, but it's one of Nick's Picks and it's amazing. What a kick to watch, but even better than a skier doing a downhill run over the yards and houses of the neighborhood is the way SherpasCinema.com tells the story. Pay attention to the way they've filmed the story and the techniques as they tie in with the music. Now think about how you might tell your story or the story of a wedding or a Day in the Life Shoot with a family! The "Carrie" Prank -This might just be the best prank ever! Nick's at it again and just sent me the link to this one. It's a prank set up to promote the new "Carrie" and it's a classic. Remember the ground rules for anything Nick finds: "THERE ARE NO RULES"...except one - whatever he finds has to leave us laughing, shaking our heads or just saying "Wow"! This is what I love about Nick's Picks...you never really know what to expect and he's always finding something I haven't seen before and I'm betting most of you haven't either. Well, check out this spoof he found on YouTube and then think about how many people you know who need a dose! It doesn't matter that three million people have already seen this video, because I'm betting most of you haven't. It's another one of Nick's Picks and what I love about it is the creativity it represents, in this case Honda's engineers. As always, just trust me and give up a two minutes of your life right now. After you've watched it, think about the same concept if you were going to do a promo piece like this of your own products - prints, albums, framed images, canvas prints, gallery wraps - plus all your services - how would you tell your story? This is one of those sick things that I'm going to just ask you to "trust me". You're absolutely going to waste a minute and twenty seconds of your day, but if nothing else you'll understand both my sense of humor and Nick's. I don't think he intended for me to run this on Nick's Picks, but if you watch it to the very end, you should be able to hear me laughing wherever you are on the planet. It's nothing more that a chuckle break from whatever you're working on...there's no sound, just a series of visuals. As you watch this video, think about the purpose of Nick's Picks...to inspire us and get us to think more creatively. I love this video, because it so reflects such a pure definition of passion for the arts. Just watch it and you'll see what I mean! Nick's done it again. His email said, "Check this video out, it's about J.R the French 'Grafitti' Photographer on TED talks, if you haven't seen it already, very inspiring! Make sure you see it to the end. It really evolves." He wasn't wrong, but I did figure out why I love so much of this stuff. For me it's about feeding my brain with something other than a project I should be working on. It's about thinking about issues outside what I'm going to post today, returning a call to a new partner on the SCU project or working to make a deadline on an article for a magazine. As trite as it sounds, it's food for thought and we all need these little tidbits that focus on different aspects of life rather than the day in day out challenges. "Our speaker at the March 2011 San Francisco, CreativeMornings (creativemornings.com) was Mike Monteiro, Design Director, and co-founder of Mule Design Studio (muledesign.com). This event took place on March 25, 2011 and was sponsored by Happy Cog and Typekit (who also hosted the event at their office in the Mission)." It's one of my favorite Vedros images and a classic in the humor section of his gallery. Nick Vedros, besides being a good buddy for a whole lot of years and giving me enough material to do a book called, "Travels with Nick" some day, is a creative genius. He's one of the best commercial photographers in the industry with a huge passion for humor. Influenced a lot by the cartoonist, Gary Larson, Nick's images are always unique. Long before digital photography and the ability to manipulate an image, Nick was creating incredible special effects in his studio. In fact, I remember the late Don Blair in his 70's in the back of the room at a Nick Vedros presentation furiously taking notes on Nick's lighting techniques. But there's something else really unique about Nick and that's why I'm starting this section with his own little cache of gems. Nick spends a lot of time searching the Internet for things that are different. Ideas that make us think. Concepts and presentations that stimulate his creativity and in turn we get the benefit. Check out his website and you'll see some of the finest work in professional photography. In the mean time, Welcome to Nick's Picks! It's a new Nick's Picks and this one is a kick to watch. Think about the level of craftsmanship going in to something that literally turns back the clock a hundred years! Check out the full article on Gizmodo. It's just a click away. There aren't very many things in this world that last that long. Especially in modern times where things are so disposable. Everything is just used and thrown out. So, in the digital realm, well, it's so easy to take a picture. It's so easy also to forget about it. Nobody is going to forget their own Daguerreotype! Right off the bat, I've got a request. Pay attention to the expressions on the driver's faces once the VaVoom button is pushed. This is brilliant advertising and so often, that's what my buddy Nick is all about. I can promise this will make you smile! Even though the video has had over three million views, I'm betting most of you have never seen it! Whether you're a golfer or not, as I've said before, just trust me! Besides, it's only 90 seconds of your day. We're all into new technology in photography, but what about golf? Years ago I was at a diving show and a Japanese company was demonstrating their underwater phone and all I could think of was, "What next?" Well, here's your answer when it comes to golf. I agree with Bubba - golfer or not, how could you not want to drive one of these? What they didn't share with us on the video was the anticipated price! It's another classic pick from Nick. While it has nothing directly to do with photography, without "imaging", words could not describe what you're about to watch. Winter always wins, but the good news is we're past the halfway mark in March and soon we'll be whining about summer temperatures! For me it's a fitting reminder why we moved to Sarasota! What I've always admired about my buddy Nick is the way he looks for things to stimulate creativity and the appreciation he as for anything that pushes you to think or simply moves you. Today's pick is another Vimeo Staff Pick and it's best enjoyed with a cup of coffee and the volume turned up enough to enjoy the combination of the images and the music. Created by Alex Roman it's simply a classic piece representing an incredible amount of work. It's another one of Nick's Picks that showed up in my email this morning. It's a classic and while it's unrelated to imaging directly, it's not unrelated to creativity. If you're like me, this will become one of your first stops of the day, just to clear your head and give you a chance to say, "Wow". A big thanks to Ornana Films for taking us some place our minds normally wouldn't go! Just trust me on this. It's another one of Nick's Picks, but between the music and the insanity I LOVE IT! And it's a great way to start the day. In all honesty, there's is a connection here. I'm betting we're all watching this and thinking, who in their right mind would ever do this? Okay, so now think about your own business and everything you do to keep it going, the assignments you take on, the weddings you've photographed and the promises you've made to clients. All of you fly without a net every single day your in business! And through all of this you've got family and friends depending on you. It's not that much scarier! A palindrome according to Wikipedia is "a word, phrase, number or other sequence of units that may be read the same way in either direction." This video reads the exact opposite both backwards and forwards. Just trust me on this and take the time to watch this. It'll be one of the best two minutes of your day! It was Nick's pick this morning and it blew me away. A 20 year old submitted this in a contest by AARP called "U @ 50". It's brilliant! An Advertising Lesson From Dodge Dart: "How to Change Cars Forever"
Yes, you probably think I'm nuts for showing a commercial for the new Dodge Dart. It's another one of Nick's Picks from a few months back. Nick is a constant student of advertising and pays attention to everything produced with a message. It's what helps him stay cutting edge. Nick sent me the link to the new Dodge Dart commercial last year and I've watched it a few times. His message only said, "Love this Commercial - Great writing." Think about the way Dodge gets the message across and the way you present your own message. You don't have to have a multi-million dollar budget to get through the noise. All you need to do is be different and hit people with an attitude that stops them long enough to recognize your brand. Branding success in this industry isn't just about being a great photographer, it's about having a message that resonates in the heads of your target audience and creates top-of-mind awareness. Get through all the noise out there and you've got a good chance at not only surviving but thriving. "Some of the most amazing footage ever. Don't miss this." But there's something more that makes this even more special for me personally. From 1987 to 1999 I was president of Hasselblad USA. Hasselblad flew on every space mission for close to 40 years. During my time with the company we would get copies of many of the rolls of film from NASA. I even remember a camera problem on one mission and Chuck Gutierrez being patched into the space shuttle helping the astronaut on the mission complete the repair. He was on the phone in New Jersey connected through NASA and speaking to an astronaut on the shuttle! Throughout our offices at the time we had dozens of stunning gallery prints of images from space. Watching this video brought all those memories back, but even better was a reminder of what we all really do in this industry. This is about imaging, creativity, art and reality...as I said a few weeks ago in another post, if this doesn't make you proud to be a photographer then something's wrong!